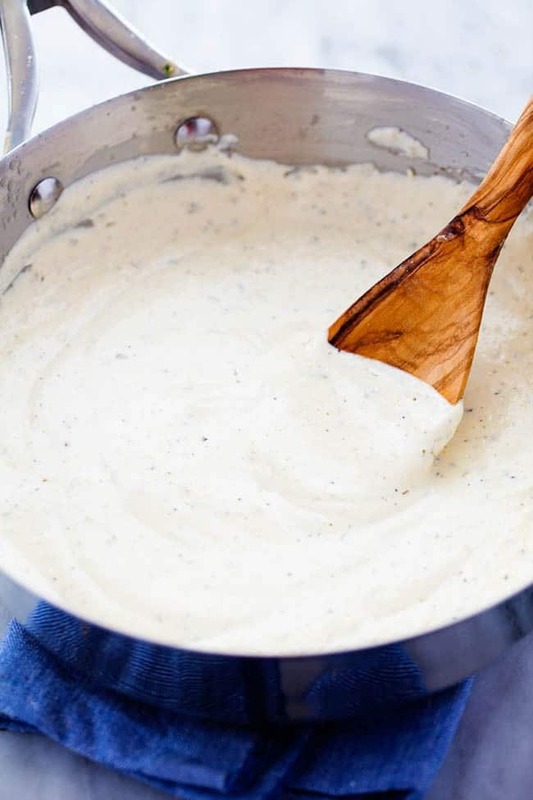 The most creamy and delicious homemade alfredo sauce that you will ever make! This is a tried and true recipe and you will agree that it is the best recipe out there! 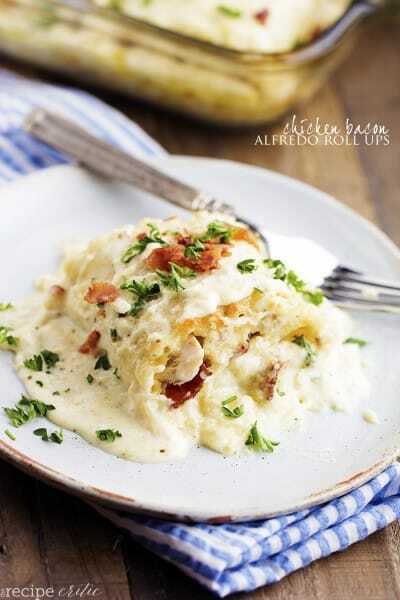 I just had to post my favorite alfredo recipe that I have created here on the blog. There are a few secret ingredients that set it apart from all of the rest. If there is one thing I can always count on my family to eat it is my homemade alfredo sauce over pasta. We recently had some company over for dinner and I made these Chicken Bacon Garlic Alfredo Roll Ups and they always are a huge hit! 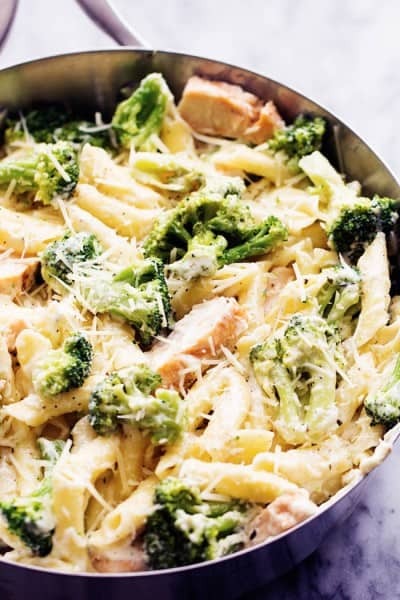 This alfredo sauce is thick and creamy and the flavor is out of the world. It is restaurant quality that you can make right at home. It has delicious garlic flavor and italian seasonings. I like to add cream cheese to my alfredo for that extra creamy flavor and texture. 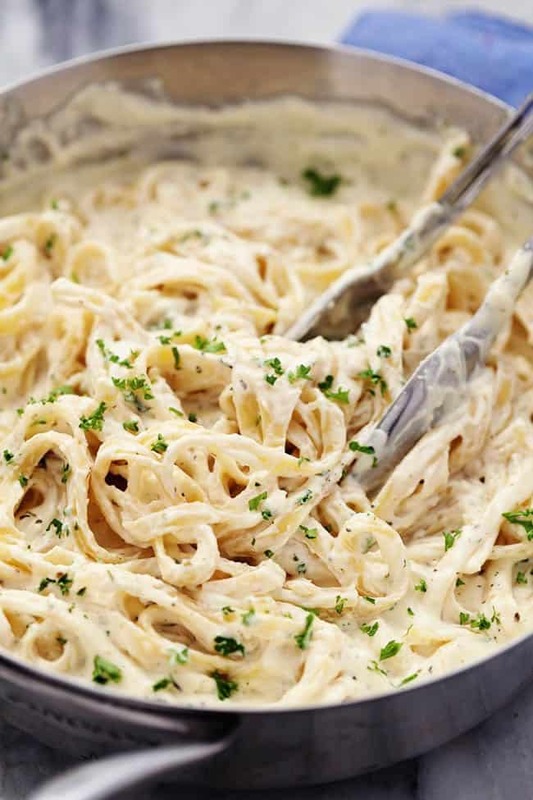 This alfredo sauce always gets raved about whenever I make it! 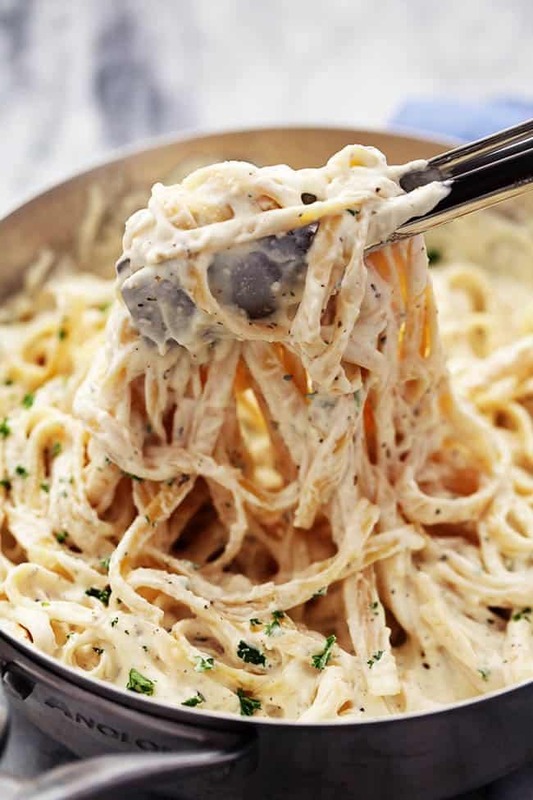 This alfredo sauce comes together pretty easily and you will never go back to the jarred alfredo sauce again! Ick! 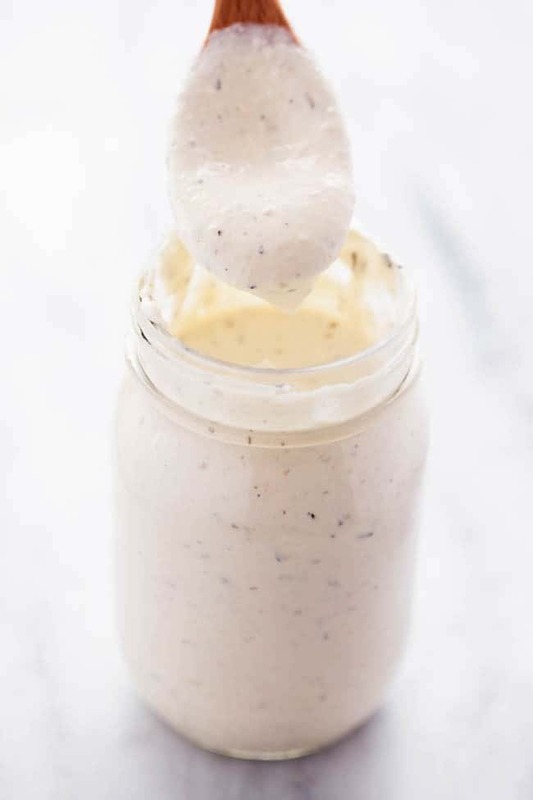 This alfredo sauce is awesome on top of just about any pasta but is also delicious used as a dip or even spread on pizza. I think this sauce is even better than any restaurant that I have been to and the best part is that you can make it yourself! It is thick, creamy, and rich and the perfect sauce on top of your favorite pasta. I know that you will quickly agree that this is the BEST! This will be a recipe that you make again and again, just like I do! Wow. This is really good and creamy. Thank you for sharing. I did not add the SALT though, because the butter and Parmesan cheese had more than enough salt for the sauce. I also sautéed some chicken breast with a sprinkle of salt, pepper, and garlic powder, then cut it up and added to the sauce to make chicken Alfredo. Can you make the Alfredo sauce ahead and can you freeze it? Hi, I am making this for a little Christmas party tomorrow with friends. Is the Parmesan cheese the grated kind that comes from the shelf (shaker bottle) or the shredded kind from the refrigerator section? I guess there is also grated from the refrigerator section as well but I have been confused before in recipes when it called for grated Parmesan they actually meant the shredded from the fridge section. Thanks for your help! I am certain you meant grated from the fridge and not the shelf, which usually refers to the stuff in the green can, right?? This looks delicious. Hi there! Can this recipe be double/tripled? I am topping about 2 lbs of tortellini with alfredo sauce, how much sauce should I make? Thank you! Hi there! Can this recipe be doubled/tripled? I’m cooking about 2lbs of tortellini for a party, how much sauce should I make? Thank you! Excellent and easy to make version of Alfredo sauce. How do you go about reheating this. Everytime I do it tends to separate. I personally find that heating it a little in the microwave keeps it from separating. Would I be able to freeze the Alfredo sauce? It looks wonderful! I’ve made this alfredo sauce several times. Tried it with chicken, shrimp, scallops and even with noodles alone. Every time it’s a huge hit. My step sons are very picky eaters but nearly licked the pot with this recipe. They’re always excited when I ask if they want alfredo tonight. Thank you for sharing such an amazingly easy recipe. 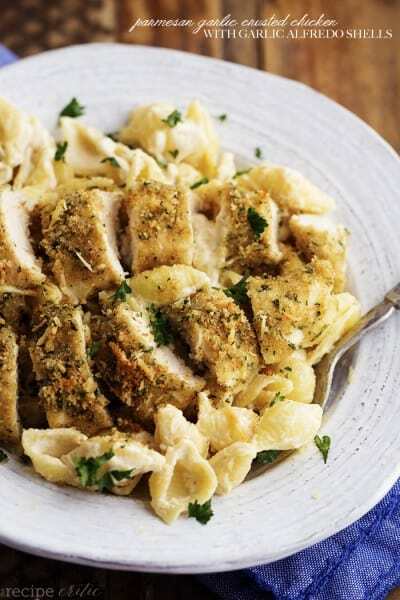 I made this recipe last night with stuffed chicken and shrimp shells and my family absolutely loved it don’t think I’m ever going to buy jar Alfredo sauce again. Thank you so much for sharing. How much pasta does your recipe make? 1LB? This is, in fact, the best alfredo sauce ever! Better than any restaurant or recipe I’ve tried. Everyone loves it and I get frequent requests for this dish. I cooked your Alfred recipe tonight and my very picky and hard to please grandkids gave it a 5 star rating!!! Great recipe, thank you for sharing!!! This recipe is awesome. I prepared for my family as a special treat since my daughter is home on Christmas break. It was perfectly delicious with shrimp and scallops! And it’s so easy I don’t have to wait for an occasion to prepare it. Thanks!! So simple, easy, and delicious! My husband’s new favorite. I tried this Alfredo recipe for the first time. It is Fabulous!! I Loved it! Absolutely amazing. The only thing i added different from the original was some button mushrooms that needed used up. Love!! I made this and then added sautéed shrimp to it. I also had to make a little separate side dish for my dad who doesn’t eat shrimp—using some leftover jerk chicken wings that I shredded up. Everyone killed it. Thanks for the great recipe! Can I make this and stick in the oven if I am making a large portion? I don’t have any heavy whipping cream what can I substitute it with instead? Delicious sauce, so easy, had it with shrimp and garlic bread. My new fav, go to recipe. OMG! I made this and my husband LOVED IT!! The best recipe hands down! Let me tell you. Usually I am skeptical of anything that says “best…” because it usually never is but THIS RECIPE!!! I added 10 oz of cheese instead of a cup and it was absolutely the cheesiest and most wonderful. Better than any type of supermarket out of the jar recipe. I need everyone to know about this. I don’t usually make reviews but this is my second time making it and I’m extremely obsessed! This was fabulous! I just decided to throw it together at the last minute using some ingredients left over from Christmas. I did not have heavy cream but I had about 1 1/2 cups of sour cream so I used that. Hubs heated up a frozen shrimp entree… and we threw it on top. Quick, easy and delicious ! I was wondering if you have ever used coconut milk (full fat) in this instead of the cream? Oh my goodness gracious! Hands down this was the most easiest delicious alfredo I have ever had/made in my life. Thanks for sharing! WOW THIS IS THE BEST! Threw together last min and only had Half and Half and it was amazing! No changes needed! Can imagine even better with full cream! My husband loved! Halved the recipe since just the two of us! Used over egg noodles with meatballs. Yum yum! I hate the jar stuff! So happy that you all loved it. Thanks for the feedback and for following along with me! Also, I agree, it really is worth every calorie! Is this recipe good for 2lbs pasta? My significant other can not eat anything tomato based but loves pasta so I thougt I would try a white sauce for him and I made “The best homemade Alfredo sauce ever!” It was better than anything I have ever eaten in a restaurant. Thank you so much and oh by the way the other half LOVED IT! This recipe has become a family favorite for us! It’s absolutely perfect! I also add mushrooms and baby spinach! I made this recipe today and is so easy and delicious!!! My family and friends enjoyed it very much!!! Can this sauce be mixed with chicken, broccli, pasta and baked in the oven? Made this and it is absolutely delicious and creamy! Though, did anyone have trouble getting the cream cheese to melt? My sauce has little clumps of cream cheese that just won’t melt. Maybe I used a cheap brand? It was room temperature. Microwave the cream cheese for 20-30 seconds to get hot. Then, stir with a fork. You can take a little of the sauce out ladle at a time and whip with your fork, until loose enough to pour back into the pan. The cream cheese has to be hot. What are the nutrition facts for this? Am I missing it? Can you add spinach to this sauce? I don’t leave reviews for nearly anything but this recipe was sooo good that I just had to. I love alfredo but hate the store-bought jars, they’re so nasty to me that they make me nauseous. But this right here, gold…no…platinum! Can I use shredded Parmesan cheese instead of grated? 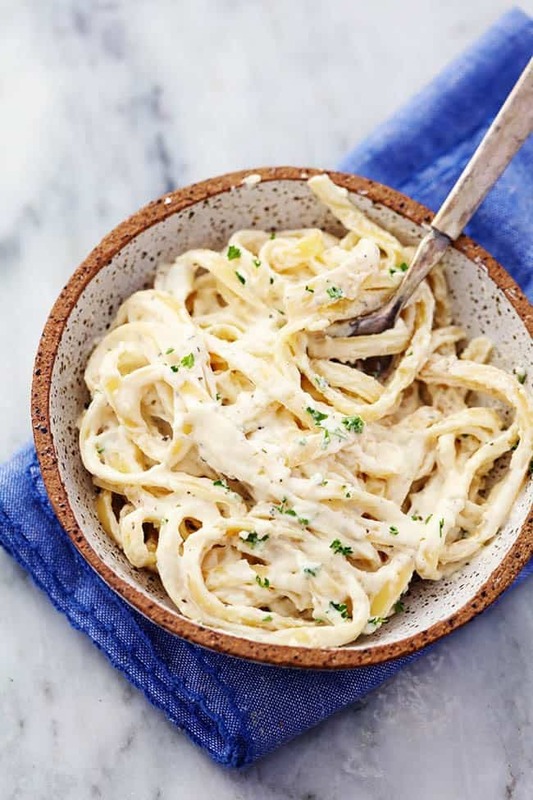 This is by far the best Alfredo sauce that I have ever had and so easy to make, I have already shared the recipe with all my close friends. Thank goodness you so much! Best Alfredo sauce I’ve ever made, by far!! Do you have the nutritional facts (i.e. calories, net carbs, protein, fat, etc) per serving for this sauce? I want to make this tonight but following the Keto diet so want to track my carbs. Just made this sauce and it came out perfect, thick ,smooth and satisfying.